A EUROPEAN COURT has ruled that doctors in the UK must continue to treat a terminally ill baby boy until midnight on Tuesday. Ten-month-old baby Charlie Gard suffers from a rare genetic condition and has brain damage from which he will not recover. He is being kept alive by way of artificial ventilation at Great Ormond Street Hospital. The child’s parents have been battling to take him to the US where he would undergo an experimental treatment but doctors have concluded that it could cause prolonged suffering. In April, a UK High Court judge had sided with the doctors and said that his life-support should be switched and he should be allowed to “die with dignity”. The couple’s challenge to the Supreme Court was defeated on Thursday and another appeal application was made to the European Court of Human Rights (ECHR). 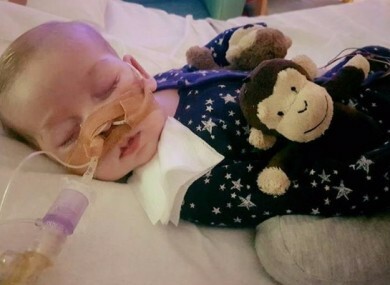 In the interests of the parties and the proper conduct of the proceedings before it, they should provide Charlie Gard with such treatment and nursing care as may be appropriate to ensure that he suffers the least distress and retains the greatest dignity consistent, insofar as possible, with maintaining life until midnight on Tuesday 13 June 2017. “The interim measure granted today in the application… has been applied temporarily in order to allow the European Court to examine the request in a Chamber formation of seven judges,” the court added. The child’s parents had hoped to take him to the US where he would undergo a treatment trial for his form of mitochondrial disease. More than £1.3 million has been raised online for the treatment, through more than 83,000 donations. Email “Terminally ill baby boy at London hospital must be kept alive until at least Tuesday, court rules”. Feedback on “Terminally ill baby boy at London hospital must be kept alive until at least Tuesday, court rules”.